What it is: A gel pot eyeliner in a crayon that delivers intense color and 12-hour waterproof..
WHAT IT IS No trouble in this paradise! Escape your 9 to 5 & transport to the tropics with th.. When in doubt, wing it out! And nothin’, we mean nothin’, makes whipping out a killer Kat Eye easier.. Introducing Mr. Write, a good looking collection of eyeliners, from theBalm Cosmetics. Commitment is..
Each eyeshadow palette contains 10 eyeshadows, with the most-used base shades doubled in size! .. Creating a perfect winged liner never felt so good. The Saharan gel eyeliner contains a kohl black a..
It’s always great to have options. And with this versatile “extreme” felt tip tool, you can line you..
Eyestudio® Lasting Drama® Gel Liner. This waterproof eyeliner has a long-lasting gel formula that..
Smokey effect with high shine eyeliner • Gel formula in automatic liner • Intense and luminous c..
Smokey effect with high shine eyeliner • Gel formula in automatic liner • Intense and luminous col..
Dip It Eyeliner can be used to subtly define eyes or create dramatic feline flicks. The fast drying .. Cheat the classic, chic groomed-girl look with no effort. Enriched with a mix of fine opaque powde..
Now anyone can create the perfect Feline Flick with my magic shodõ pen that’s so easy to use, it p..
Line and define with Ink Pot Eyeliner’s intense black gel formula. 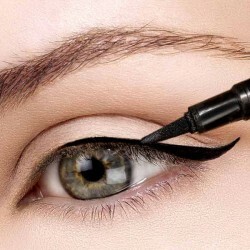 This innovative eyeliner glides o..
em tip: your eyes are the windows to your soul… enjoy decorating! each shadow palette contains li..